Yep, I was too lazy to actually come up with a title for this post. Sorry. Remember George, the yarn I spun not too long ago? (named by Cookie - it's there in the comments. Oh my gosh, that was over a month ago...). I sent him off to a friend in Missouri in exchange for some fresh lavender and guess what came in the mail today! The front was even more beautifully decorated, but I thought it would be weird if I shared both of our mailing addresses on my blog, so you don't get to see that. There was more than lavender in this box, let me tell you. In fact, said friend did a very thorough blog post about everything inside, so I'll direct y'all over to his blog to read about it. In summary, there's a 1/2 pound bag of Icelandic top that he would like me to spin for him, two satchels of lavender, 1 of silver lemon thyme (very delicious smelling), 5 little skeins of cotton yarn, 2 balls of laceweight wool, and an adorable little cat named Pierre who wanted to come visit. He'll be making appearances around the blog from now on, so keep an eye out for him. Thanks KnittaPrince! 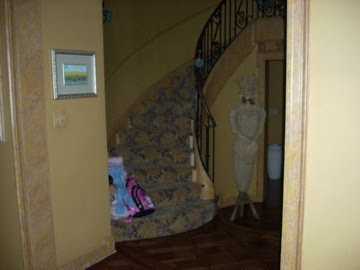 I walk past that staircase a lot and rarely have the lights on in that part of the house, so I would always see this mannequin out of the corner of my eye, in the dark, and I think it gave me a heart attack every single time I saw it. While I was at the house this weekend, I made Delain a sleeve. The air conditioning is always freezing in that house and I thought Delain might get cold. Aren't I thoughtful? ...and sadly, also while house-sitting, I watched what I presume to be the last rose of summer come and go. I don't think it's a good sign that I'm already sad to see the coming of Winter (yes, I know Fall has to happen first, but really that's just a mild extension of winter here...). I don't think I'm going to be a happy camper come colder weather. How come they need security alarms with that mannequin lurking inside the house? 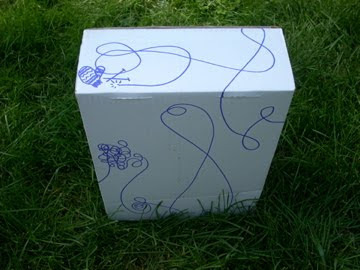 What a wonderful parcel you received! I wouldn't have to worry about the winter coming on - first time I saw that mannequin out of the corner of my eye I'd have dropped dead from fright. I seriously love that photo of you in Delain. I think you need to wear it like that always. If you ever have to house sit again, carry knitting needles with you at all times so that you can stab the mannequin if it attacks. 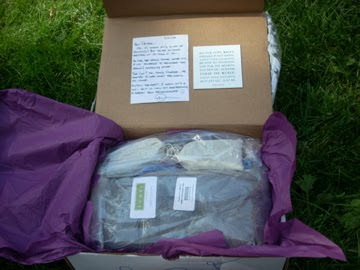 And your lovely shipment of lavender + goodies puts the Knit Picks package I received today to shame! Have fun with it. That mannequin is truly very scary. Delain in looking great! I'm fighting the urge to cast on three sweaters I really want to make right now, and seeing other's WIPs makes me want to cast on even more. 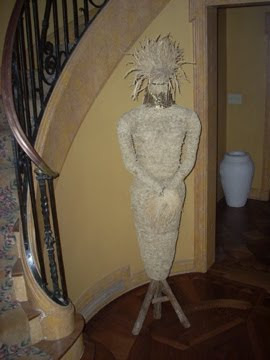 I think the statute would be a lot less scary if it were wearing a nice handspun, handknit long sleeve, turtleneck sweater. Just saying. Duuude - I have house sitting stories that would knock your hand knit socks off. In the bad way. Let's just say: multiple neighbors and friends with keys, creepy pregnant naked lady pictures and "art" and creepy dead headless dolls. Ugh. Just ugh. I feel your creeped out pain. Hey, OTOH, at least you got a cool package! Swell! 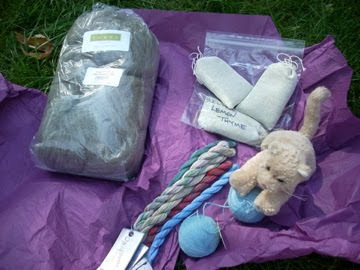 What a lovely and thoughtful parcel! At least you'll have Delain (and all those hats you've knit)to keep you warm come the winter weather. Wow! You totally have the best bloggy friends ever! Whatcha gonna do with all that lavender? Dude, I love your package (is that weird to say?) The sweater seems to be coming along nicely. I love the picture of the rose, you always have great pictures! But actually getting to wear your knits will be the part of winter to look forward to, yes? You are a better house sitter than myself - I would have had to find a closet for that mannequin. I'm with Carrie - Delain is perfect the way it is. No need for sleeves. Lemon Tyme is one of my favorite scents - enjoy it while you can!! Your sweater is coming along beautifully, I can't wait to see what it looks like finished. I too am not ready for winter. We sort of skipped summer here for an extended late spring. Boo on that. I can understand and share your feelings about winter...although I feel a little like I don't have any room to complain as we certainly have milder winters here in St. Louis than you do in the North. Dude, that mannequin is totally creepy, especially with that rooster tail hair-do! Pierre has a twin brother, named François. Delain is looking so great! very nice work :) and wow, what a swap package! nothing like a great package in the mail to make you smile all day. Wow, what a great package! And what a creepy mannequin! Delain is looking fantastic. And who knows, there could be more roses...ours sometimes bloom clear into mid-November! I have to agree with TA and say that you do take awesome photos. You definitely have an artist's eye for beauty. That was a great care package and enjoyed reading the blog about it. It was definitely sent with great care and forethought. I'm sure your room now smells all wonderful with lavender. Also, I think it is cute that you name all of your creations. It's such a creative idea. Well, why not as they are sort of like your children or I should say your creations. You put a lot of time and energy into their creation, so why not personalize them?